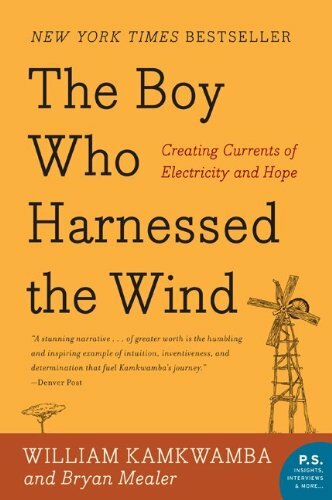 This book, The Boy Who Harnessed the Wind, is a truly inspiring story of the idea that Anything is Possible. This phrase has been on my mind a whole lot for whatever reason, and it has been reinforced through many of the things that I have read lately! Whatever I am being prepared for: I AM READY!!!! 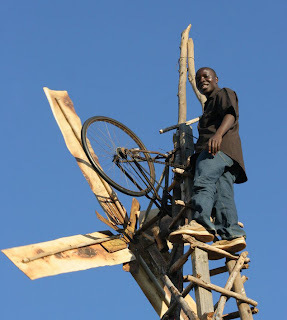 Really wanting electricity in his town, William read about and built a windmill using scavenged parts from a scrap yard. His first windmill was made from PVC pipe, a tractor fan, an old bicycle frame, and tree branches, and powered four light bulbs and charge mobile phones. William is truly a self-taught man. It was reconfirmed to me that Reading is Fundamental, and this was definitely true for William. Also, I know about William, because I read his story. Sometimes I get caught up in my world, and need to be reminded about the rest of the world and be moved to action. People, read like it is a matter of life or death, and sometimes it is. I know for sure, without a doubt, as stated by William: "Anything is Possible when your dreams are powered from the heart!" Also, in the words of William: If you want to make it, all you have to do is try." This is a book that Purdue University is encouraging all of its students to read, and I agree that all Purdue students should read this book, as well as, all other people who live in countries who have an abundance. Everytime that I flip on a light, I will think of William and his people. Click the link below to watch this amazing clip on William! 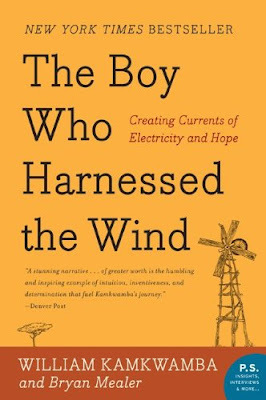 The boy who harness the wind by producing energy with with a wind mill by deriving the know how by just submerging himself with books in a library would have been highly praised in our parts of the world for such a significant achievement. 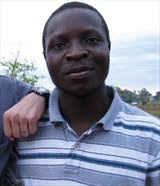 Given Mr Kamkwamba youthfulness and the lack of resources in his country and his ability to construct and operate such a significant device makes his creative propensity appalling. Perhaps his book will afford him the wide recognition he deserves and the opportunities to promote and propel his creativity.